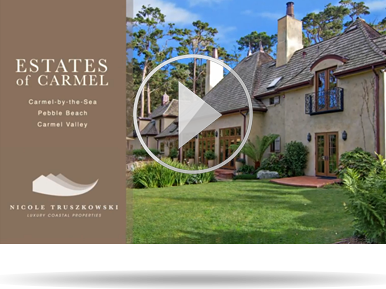 Welcome to Estates of Carmel the premier full service residential real estate website and informative local Carmel & Pebble Beach Luxury Real Estate Blog for homebuyers and sellers on the Monterey Peninsula. Each community profile showcases: neighborhood listings, area maps, photo galleries, monthly real estate reports, and popular local links. Customize your personal home search and preview all local MLS listings. Buying and selling a home is one of the biggest financial decisions in your life, choose your real estate professional carefully. "We met Nicole at an open house in Carmel and were immediately impressed with her presentation of the property. Her knowledge of real estate information in general and especially that of our area was also quite extensive. This, plus her grasp, and use of today’s necessary electronic technology to promote and sell real estate, established her as the agent we wanted deal with.Nicole has never disappointed us. She has used her expertise to sell us... continued"